Due to it being a weekend, I’ve actually made quite a bit of progress. I’m still not 100% sure about getting it all ready for this weekend yet, as there is still a bucket load of stuff left to do. The photo to the left I’ve just taken and shows the knee joint pretty much posed and finished. The hip joint is also the correct size, although I need to fit the two pieces of plastic rod for this to be 100% done. The other leg also needs to be cut off, but I’m currently thinking that I’ll get the right leg glued, filled and finished before I start on that. I need to get hold of a Chaos Space Marine or some other creature to go under the right foot – which also needs it’s toes repositioned. Before I stopped for the night, I managed to get the pelvis plastic rods cut and glued and a piece of guitar wire bent and glued into place for the pipe that connects the thigh to the groin. It actually looks quite good. I need to cut the other leg off before I glue the calf into place and fill the gaps that were made by the saw when I cut the leg in half. If you look, I’ve extended the hip by a few millimeters – somehow it just seems to look right. The other benefit of doing this, is that the Dreadnought will be wider than normal – something that should make it stand out that little bit more. Overall the legs have come on a huge leap over the weekend and with not too much more work, should be ready for this weekend coming (i.e. my first deadline). Although I am out tomorrow, I should be able to get enough work done tonight and Wednesday to have it pretty much completed. The torso currently concerns me however. I have a number of major items that still need to be resolved. Firstly I’m struggling to get the right look for the chest piece on the torso (the bit that will be painted with a shark tooth grin). I just can’t seem to locate anything with the profile I’m after. Ideally it needs to be conacle – that is cone shaped, so the bottom is slightly narrower than the top. I could try creating a former and heating up plasti-card around it, but that could be fairly time consuming. As a back up I have got a length of plastic tube that fits into the centre of the torso, which I could use to make a venerable dread style chest, but I’m not actually a fan. Next up, I still haven’t resolved the powerplant exhausts. 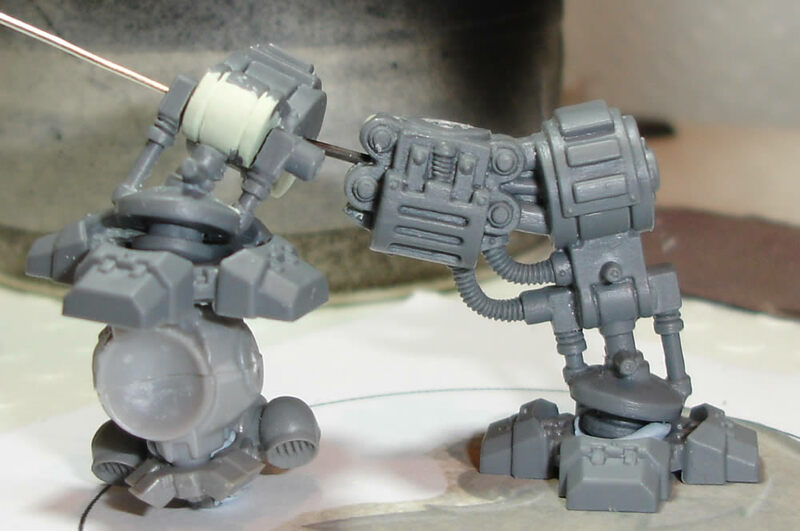 The ForgeWorld model still seems like the most logical (if pricey) option, but it seems a shame to buy a model for just a couple of pieces. Lastly, I need to work out how to do the joint that connects the arm to the torso. On the original model, this is just a series of disc shapes glued one on top of the other, however as I am going to adjust both arms slightly this doesn’t work very well (you’d end up with gaps). I did try twisting wire around a tube, but the first attempt didn’t come out very well. That said it could be worth trying again, but with smaller wire and a narrower tube. I have also given the base a little bit of thought. Bases are as essential as the actual model and should be used to ‘frame’ a miniature. Many people use the base of a miniature as an excuse to cram more detail onto it, but I personally think that this often detracts from the actual thing stuck on the top. I’ve always set my mind on having a snow base for my Dreadnought. It fits in with the Space Wolf background and compliments their grey armour. It will allow me to sculpt foot prints into the base and you can create some dymanic to the miniature by having areas disturbed – i.e. building a narrative. Another benefit of a fairly bright base is that in a display cabinet it stands a better chance to be noticed, I know this sounds a bit daft but its it’s a trick that can help a lot. Now just having a flat expanse of snow is going to look pretty naff, so I’m going to bulk the floor of the base up with cork to mimick rock. This cork will be hacked into a rough wolf’s head shape, so when viewed from the top, you’ll be able to make out the wolf, but from ‘ground level’ it’ll just look like rock. To this end I’ve ordered a pack of 60mm bases and have some cork sheet in the cupboard (actually cork coasters).